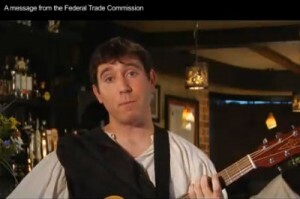 The Federal Trade Commission is trying to prevent people from getting scammed by FreeCreditReport.com by releasing parodies of the infamous commercials featuring Eric Violette using their own, less dreamy, singer guy. They encourage you to go to AnnualCreditReport.com instead, since you don’t have to sign up for any dumb memberships or pay any hidden fees to get access to your awesomely low credit score. That’s right, FreeCreditReport.com sure isn’t free, people. Don’t let that doe-eyed, curly haired french-canadian singer foolz ya.